The media is reporting that the European Commission intends to ‘fast track’ the proposed EU-Japan free trade agreement, in an effort to circumvent any campaign from groups and trade unions opposed to scrutiny-free trade agreements. It would represent an effort to avoid the debacle of the trade deal with Canada (CETA) which was almost derailed two years ago. However, according EU trade expert Glyn Ford, the bulk of the EU-Japan deal will go through as an ‘EU only’ deal – meaning it only needs a qualified majority of council ministers and a vote in the European Parliament, with no role for individual EU states. 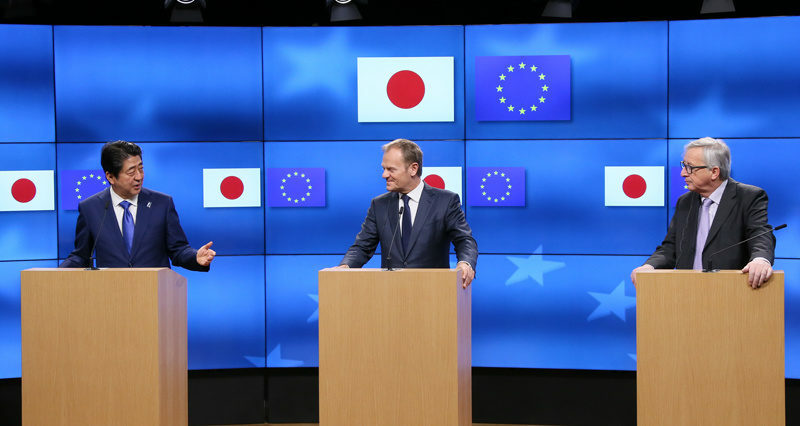 The European Union and Japan concluded negotiations to create the world’s largest economic area in December last year. And they intend to drive the deal through which will remove EU tariffs of 10% on Japanese cars and the 3% rate for most automotive parts. It would also scrap Japanese duties of 30% percent on EU made cheese and 15% on wines, and secure access for EU countries to tender for contracts in Japan. The EU Commission now intends to present the deal to the European Parliament along with another smaller trade deal with Singapore, with the Commission working to sign the deal in June with the agreements coming into force in 2019. But the EU also wants the deals in the bag before Brexit Day – meaning they will apply to the UK during the transition period lasting until 2020. If the dates are not met, the UK will be outside and free to do a deal of its own, although it is expected that the Japanese are much more interested in doing a deal with the EU. The agreement bears a strong resemblance to the now-defunct Transatlantic Trade and Investment Partnership (TTIP), which would have significantly reduced regulatory barriers for big businesses to trade in Europe. Much like with TTIP, the EU-Japan deal is being fast-tracked so that the presence of investor protection clauses (such as ISDS) goes unnoticed. This would allow multinational companies to threaten legal action against government’s who make decisions that damage company profits or investments. But the EU and Japanese negotiators are yet to agree on the way in which foreign investors should be protected, with the Japanese preferring to use its own domestic laws to settle disputes. Three of Japan’s car makers – Honda, Toyota and Nissan – manufacture cars in the UK. The vehicles are then exported to the rest of Europe. Whatever happens, we can’t allow another TTIP-like deal to go under the radar. Tony Burke is Assistant General Secretary of Unite and is a Contributing Editor to Left Foot Forward.